A while back, I got a beautiful new scarf in the mail. I couldn’t wait to wear it to church, so the next time I wore a black dress, I had Fluffy grab it for me out of the Chinese wedding basket that serves as my scarf drawer. I thought I looked stylish all day long, so I was puzzled to have people come up to me several times throughout the day and thank me for supporting “the cause.” Frankly, I had no idea what “cause” they were talking about. It was only later, when we started fast-forwarding through a bunch of pink-related commercials on CBS, that I realized I had dared to wear a pink scarf in October, which has been commandeered as breast cancer month. I have nothing against breast cancer, mind you. Wait. That came out wrong. I have a whole lot against breast cancer. I am not in favor of breast cancer. I have a ton of friends who have had breast cancer, and some who have breast cancer even now, and I am not in favor of any of that. What I meant to say I am not in favor of is breast cancer being considered as somehow worse than the rest of the illnesses — multiple sclerosis or heart disease or lupus or lung cancer or any of the others. Why does somebody else’s illness merit a ribbon and a color and a whole month of its own and all the solidarity and the hugs, when the other illnesses don’t get anything but a get-well card? The people are just as sick, and they feel just as traumatized. Don’t they deserve just as much fanfare and love? Why can’t I wear a pink scarf anymore without it being assumed that I’m doing so in order to support “the cause”? Why can’t pink just be pink? Now they have stolen my color and I have no choice except to love purple, except I have to be careful what shade of purple I love because some shades of purple are a secret code (wink-wink) to let people know we are gay. Speaking of which, as a bona fide lover of colors, there is nothing that warms my heart more than the color spectrum. God outdid Himself when He did the color spectrum, which is why even though I had a perfectly serviceable set of mixing bowls and measuring cups and measuring spoons, I have recently acquired a brand new set of each, just because they came in a spectrum of colors. 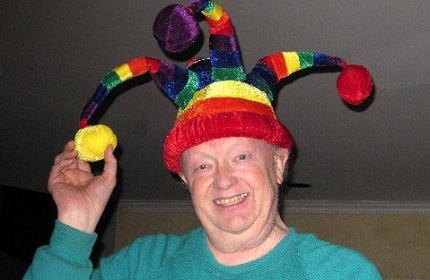 In addition, I got a nifty jester’s hat for Christmas, which Fluffy enjoys wearing so much that I will probably end up getting him one too so we can go as a matched set on Halloween. There is only one problem with the jester’s hat. The rainbow has been appropriated as part of a political agenda. I am too old to espouse political agendas. When I wear a rainbow, I want it to be because I like colors. Can’t I just like colors anymore? Like me, Fluffy is too old for a political agenda. 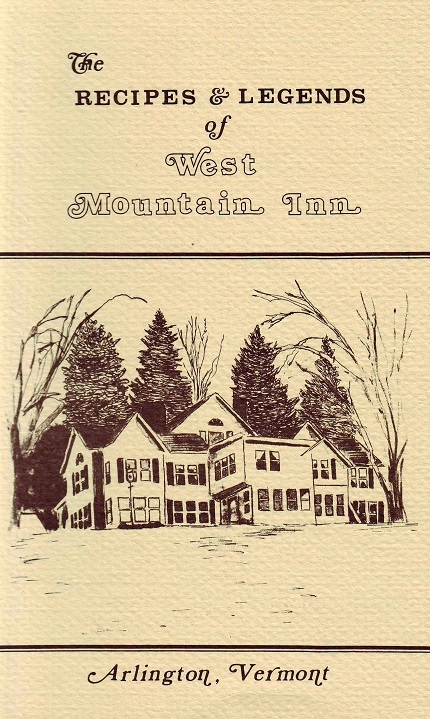 Many years ago, when Ronald Reagan and Mikhail Gorbachev were the leaders of the civilized world, I got a job writing a cookbook for the West Mountain Inn in Arlington, Vermont. Let’s just say this was not a high-paying gig. I scored $1,000 for this cookbook, and that was in the days before word processors. This meant I not only had to type the thing, but I also had to add the headlines with press-on lettering. I also was responsible for the artwork, which meant I had to teach myself how to do pen-and-ink drawing to illustrate the rooms of the inn as well as the food. I worked hard for my thousand bucks. In the process of doing the research, Fluffy and I spent a week at the inn in the dead of winter, right after Christmas. It was unspeakably cold. We were pretty much trapped in the inn by the snow the whole week we were there. If we wanted souvenirs of the experience, we were limited to a pottery factory that was housed out in the barn of the inn. The pottery-maker did not sell his pottery cheaply. In fact, the only creation of his that I could afford was a garlic keeper. There was just one problem. Every single garlic keeper was decorated with a peace symbol. Call me unpatriotic (or worse, a warmongering Republican), but I just didn’t choose to decorate my home with peace symbols. Fluffy and I sought out the proprietor and asked him if he had any garlic keepers that did not have any peace symbols on them. He told us no. He had made a conscious decision that as his contribution toward world peace, every garlic keeper he produced would be decorated with a peace sign. Once we were a discreet distance away from the proprietor, Fluffy and I laughed and laughed about this. We could just envision Reagan and Gorbachev having a secret summit at the West Mountain Inn in Arlington, Vermont. Negotiations were breaking down because both men, you see, were hoping for war. Just as they were about to agree on a course of global destruction they wandered out to the barn, looking for gifts for Nancy and Raisa. There they spied the garlic keepers with their hopeful plea to give peace a chance. Nuclear warfare was averted and the world was saved. Fluffy and I enacted the scenario with all the drama we could muster. Often. He and I are easily entertained. The thing about the hippie potter and his give-peace-a-chance garlic keepers was that it was the potter’s choice to make them, and it was my choice not to buy them. The potter did not decide that every garlic keeper on Planet Earth had to be decorated with a peace sign. He only decided that his would be. And that’s the way we should wear our convictions. If our hearts tell us that we’ll wear pink in honor of our friends with breast cancer, or carve peace signs into our stoneware garlic keepers in the hopes that by doing so we can prevent the apocalypse, let’s go for it. But please, please don’t make the decision for the rest of the world. There may be some people out there who decide that for them, pink symbolizes finding a cure for eczema, or that what looks like a peace sign to you represents a chicken foot of “Chicken Foot” dominoes fame to them — and that’s fine too. Or there are people who think that for them, wearing pink means nothing more than that they like pink. God made each of us in glorious individuality. We’re all different, because that’s who we are. When a rainbow appears, you may think of one thing. I think of the glorious diversity of colors, because that’s who I am. And the difference is just fine with me.